I always say they should have called it finger writing not handwriting. 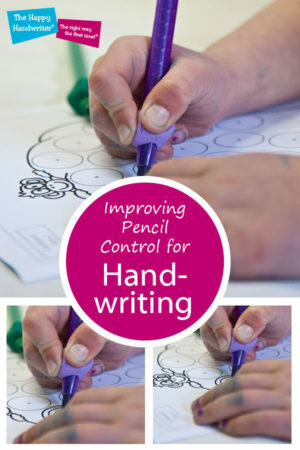 Because it is the finger and thumb movements that facilitate pencil control for handwriting. It is the discrete refined finger movements, isolated from the hand movements, that are necessary for speed and quality of handwriting. Of course, finger movements don’t stand alone. They require the stable base offered by the hand, the arch of the tuck-down-two® (the 4th and 5th fingers) and stability and subtle movements of the wrist. But once all those are in place (along with the numerous other foundations) we want to get those fingers moving. As pencil grip is developing in our little ones, it is normal to achieve movement from the shoulder. 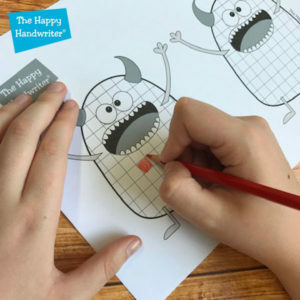 As the child’s motor skills progress, movement for drawing is achieved from the elbow, and then progresses down to the wrist. 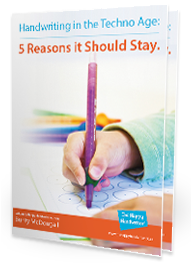 This is a normal developmental sequence and we want our children to go through those stages. But we don’t want them to stop there! 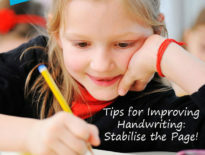 Handwriting that uses movement initiated from the wrist is tiring – those movements are big and there is lot of handwriting that needs to be done in, for example, a three hour exam. Try it – do a whole lot of little movements from the wrist. After a while it starts to get tiring. Then do a whole lot of little finger and thumb movements, as though your were writing. They are tiny and they are efficient. So, handwriting is less tiring and the quality is usually better. This is what we are aiming for – the tiny isolated, discrete, refined finger movements that move independently from the hand. And that is what develops pencil control – the ability to move the pencil in a controlled and refined manner for handwriting. Once your child has developed and movements have progressed from first being initiated at the shoulder, then the elbow, and finally to wrist movements; it is time for finger movements. The hand has to rest on the working surface. The tuck-down-two® need to be providing stability, so the-three-friends® can get moving. What often happens with our children is that they tend to get stuck somewhere – for example with wrist movement – and the finger movements just don’t develop. 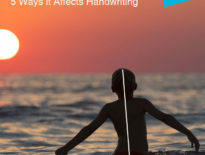 This compromises pencil control for handwriting. The same happens if they use a thumb wrap grasp – the finger movements don’t get a chance to develop. It isn’t enough to just correct the grasp – we need to build the finger movements in. We need to teach the-three-friends® how to move. As you know, these come after the development of the other foundational components for pencil grip. I always like to start without the pencil when preparing the foundational muscles for the movement patterns I am going to be asking of the child. Over the years I have used countless numbers of different activities, but I have certainly found and developed my favourites, and I am going to share my top 5 with you. These offer just what we need to develop the refined isolated finger movements. Just because they come first it doesn’t make them my favourite or more important – it just makes sense for them to be the first on the list. Using the-three-friends® of both hands the children crumple pieces of crêpe paper into a ball. Then, using only the preferred hand, it is time to do some rolling. I have had children who battle with the isolated movement of the-three-friends® and move their forearm in a circle in an attempt to get the movement! But with time and support they get to the point of being able to roll those scrunchies using only the movement of the-three-friends®, while the hand provides a stable base from which to move. Sometimes, after doing workshops I happen to pass by where these are being put into practice. And for some reason people seem to ask of the children to crumple with one hand. And that bothers me because I find that they use strange patterns while trying to achieve the movement. It’s both hands for the crumpling, and then one hand for the rolling. Tops are always with the-three-friends®, and only with the preferred hand. It’s not that I don’t value the supporting hand, but I don’t want to waste a valuable opportunity to develop the writing fingers! Right handers must spin in a clockwise direction and lefties in an anti-clockwise direction. The reason for this is if, for example, a right-handed child spins in an anti-clockwise direction, the thumb ends up in the palm of the hand. I like the hand to be open and ready to receive the pencil. Choose your spinning tops carefully! You want the stem of the top to be big enough for the-three-friends® to grasp it. Those little tops with tiny stems that come out of Christmas crackers are not what you are after. 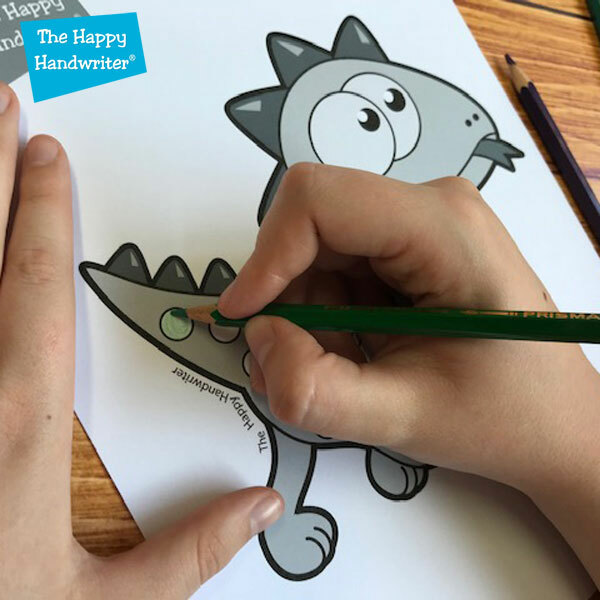 In this activity we are using the bend-stretch movements of the fingers to colour a block. This develops the movements we need for the sticks of the letters. It is not about the colouring – it is about the process and the movement that is achieved while doing the colouring. There is a sweet spot that I call the “resting place,” and the hand always needs to sit on the page on the “resting place.” Remember, if the hand is off the page you are not getting finger movement, you are getting a hand or whole arm movement. So, we rest the hand on the “resting place,” and gently bend and stretch the fingers to touch the top and bottom line of the block. No one likes colouring in random blocks but if you block off a popular cartoon or movie character, co-operation increases greatly. The children’s fingers get tired when they do this – why wouldn’t they – they are using muscles and movements that are new to them. But in a couple of lessons, they are on their way and their fingers move like pros. And now they have built in the movement for achieving the vertical line for forming letters and this will improve pencil control during handwriting. Again, the hand needs to rest on the “resting place.” And then, using both clockwise and anti-clockwise movements, the child colours in the circles. I encourage the children to start at the outside border of the circle and slowly move inwards using circular movements. This builds in the movements for tummies of the letters, and that is why it is on my list of top 5 for pencil control exercises. 5. And Spirals! I LOVE Spirals! It is not the ability to draw the spiral itself. 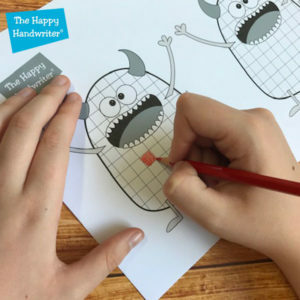 It is that when the hand is stabilised, resting on the page; the bend-stretch movements of the fingers in conjunction with subtle wrist movements, facilitates the finger movements we need for handwriting. We do both clockwise and anti-clockwise spirals so we build in the movements for the tummies for example of both the b; and the d.
Exercises for handwriting improvement need to be tackled from both the side of improving the grip, as well as building in the movement patterns for letter formation. I have found over the years, that addressing both is the recipe to success in pencil control exercises. And when the refined finger movements have been built in and the grip has been addressed, exercises for letter formation are more beneficial, because the foundational pencil control is in place. Download your free pencil control worksheets by entering your details in the form below.